Reviews on Clinical Pharmacology and Drug Therapy is a scientific peer-reviewed medical journal published quarterly since 2002 under supervision of professor Petr Dmitriyevich Shabanov, MD, PhD, Head, Dept. of Pharmacology of S. M. Kirov Military Medical Academy. 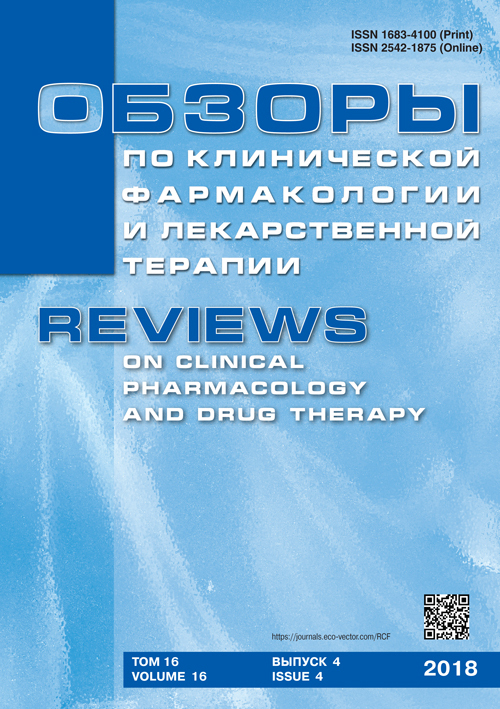 The journal is published with the assistance of "The St. Petersburg scientific organization of pharmacologists" and "The St. Petersburg scientific organization of physiologists, biochemists, pharmacologists of I.M. Sechenov". The journal publishes original papers reporting fundamental, medical experimental and clinical research, literature reviews, lectures, case reports, and information on all relevant issues of clinical pharmacology, drug therapy and related subjects. Topics focused on key issues in basic and clinical pharmacology. The journal is aimed at researchers, physicians, educators of medical academic institutions, scientists, pharmacologists, druggists and all specialists in related fields of medicine including residents, research fellows, and medical students. Integrate Russian scientific efforts and vast experience in development and use of medicines of various groups with international science and create international space for discussion and opinion sharing scientists in the field of clinical pharmacology and drug therapy. Provide physicians with actual and qualitative scientific information on the most modern and effective medicines. Chernykh I.V., Shchulkin A.V., Popova N.M., Kirichenko E.E., Yakusheva E.N. Urakov A.L., Gurevich K.G., Sorokina I.A., Lovtsova L.V., Zanozina O.V., Barsuk A.L. Radchenko E.V., Sykhovskaya O.A., Galankin T.L., Kolbin A.S., Smirnova M.A. Pavlova M.V., Vinogradova T.I., Zabolotnykh N.V., Ershova E.S., Sapozhnikova N.V., Chernokhaeva I.V., Archakova L.I., Vitovskaya M.L., Dogonadze M.Y., Starshinova A.A., Grishko A.N., Yablonsky P.K. Khokhlov P.P., Tissen I.Y., Lebedev A.A., Bychkov E.R., Shabanov P.D. Petrova I.V., Radzhabov R.M., Abdulov A.R., Manatov M.G., Glushakov R.I., Proshin S.N. Sambukova T.V., Yatmanov A.N., Yusupov V.V., Shabanov P.D.